Google Data Studio Makes Reporting Easy! One of Dealer Teamwork’s primary goals is to make digital marketing easy to understand and use. That’s why we recently created Google Data Studio reporting dashboards for every dealer using the MPOP™. These real-time, customizable reporting dashboards provide a simplified overview of your most important metrics. Have something else that you want to watch and measure in your reporting dashboard? Just let us know, and we’ll help you create the view that you need to help you measure your marketing activity. Early feedback from dealers has been positive! Watch our Google Data Studio Reporting Dashboard video overview for more details! Welcome back, we’ve got another awesome feature update to share with everyone today! Dealer Teamwork is excited to introduce your new reporting solution using Google Data Studio. Every Dealer Teamwork client now gets their own reporting dashboard. You’ll have access to reports that are easy to read, easy to share and fully customizable – anywhere and on any device. The new dashboard format makes it easier for you to understand all of your reporting. Plus, it’s designed to help you make better business decisions. Your new Google Data Studio dashboard provides a simplified overview of your Google AdWords and Google Analytics reporting. Here’s a quick overview of what you’ll get! 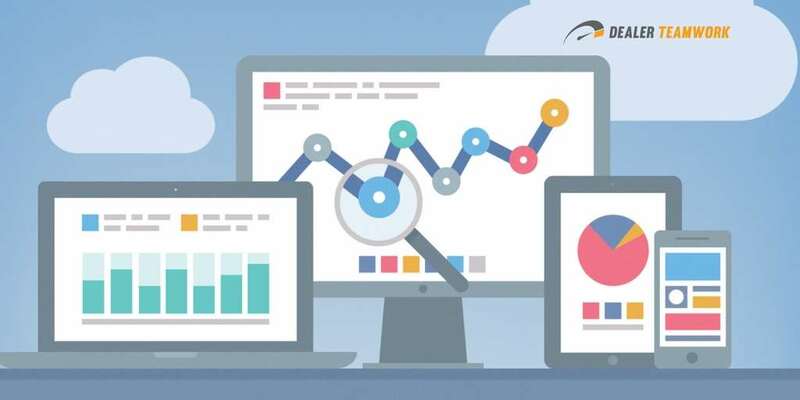 The second page provides access to your primary Google Analytics metrics for acquisition and behavior reporting, device category, top pages and your site sessions by location. Data Studio helps you create a beautiful, dynamic reporting dashboard. Please contact your Dealer Teamwork Account Manager to review your new dashboard in more detail, and to help answer any questions. We know you’re going to love your new Google Data Studio reporting dashboard.